After missing last month’s Daring Bakers challenge, I told myself I wasn’t going to miss the next one. Since joining this lovable bunch of bakers, I have been able to exercise my baking muscles to churn out such things as Sticky Buns, Bostini Cream Pie, and Tender Potato Bread. Each challenge brought about new knowledge of baking techniques and tips (with over 300 Daring Bakers in your support network, there is a wealth of knowledge to be shared!). So I was looking forward to getting back in the swing of things this month. 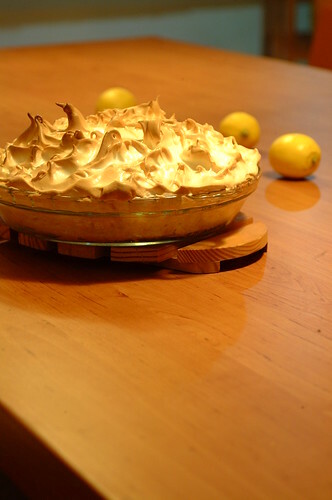 And this month’s challenge is…Lemon Meringue Pie. Zoiks. But that is why I joined this group…not to bake what I have baked a hundred times before, but to conquer things that I have never baked before…things I would never even think of baking…things that make shiver and shake and yet, as any Daring Baker would, still swagger into the kitchen, Microplane zester in one hand, citrus reamer in the other, to look that lemon in the eye and whip those egg whites into shape. And that’s what I did. Sort of. So, the filling. It seemed to come together like a charm…thickening quickly and blooming into a beautiful shade of yellow. I poured it into the pre-baked and cooled crust and hoped for the best. 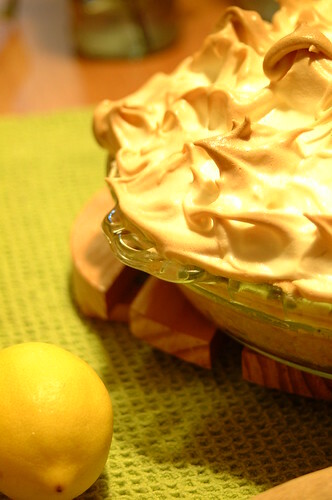 I started on the meringue, my knees knocking a bit. How challenging is it to do something you feel is your weakness, at the same time knowing you won’t enjoy eating it? Very. But, as is often the case when I push myself to do something out of my ordinary circle of things, I was pleasantly surprised. I like making meringue! Watching the egg whites magically turn pearlescent as you add the sugar. 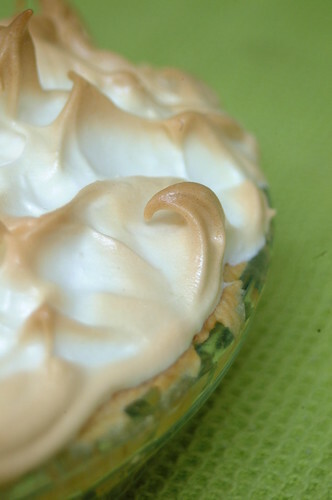 Piling mounds of sticky, cloud-like pillows onto the pie. Swatting at it with a spatula to coax peaks and swirls out of its surface. Then seeing it get all toasty in the oven. Like toasted marshmallows. It’s a very bibbity-bobbity-boo moment (it’ll do magic believe it or not!). Thanks to Jen the Canadian Baker for choosing this challenge and giving me the opportunity to make something I wouldn’t have made otherwise! I think I can finally distinguish between “soft peaks” and “stiff peaks”…yay! 🙂 Jen, you don’t know how long I have been agonizing over the difference…so from the bottom of my heart…thank you! You can find the original recipe here. Check out the other fabulous creations from the Daring Bakers here!